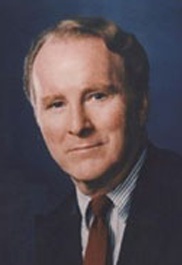 In 1985, Congressman Tom Downey accused Dornan of yanking his tie, calling him a "draft-dodging wimp," and threatening him with bodily harm on the floor of the House. In November 1996, Dornan reportedly shouted at William Dougherty, member of the Orange County Republican Central Committee: "You are a disgrace to your baptism! [...] You are a poor excuse for a Marine. You are a pathetic old senile man. You are a slimy coward. Go register in another party." FRANKEN: Bob Dornan and I once did the Politically Incorrect show together. Before we went on the air, he comes to the green room, starts spinning off this Vince Foster murder stuff, finally comes up to me, says he's a big Stuart Smalley fan. So as a result I talk to him every once in awhile. And he's totally entertaining. I abhor his politics, and he knows it. I make no bones about it. But he's actually very funny. SALON: Is he able to laugh at himself? FRANKEN: Well, I told this joke at the White House Correspondents Dinner a while ago. I said, "Having Al D'Amato leading an ethics investigation is like getting Bob Dornan to head up a mental health task force." So a few days later Dornan calls me up, and he tracks me down in some office in Hollywood. He says, "Al, I hear you did me in at the White House Correspondents Dinner." "Well, I did tell a joke." He says, "What was the joke?" I tell him. There's this pause. Then he says, "Oh... that's okay." Son: Robert Kenneth Dornan, Jr.